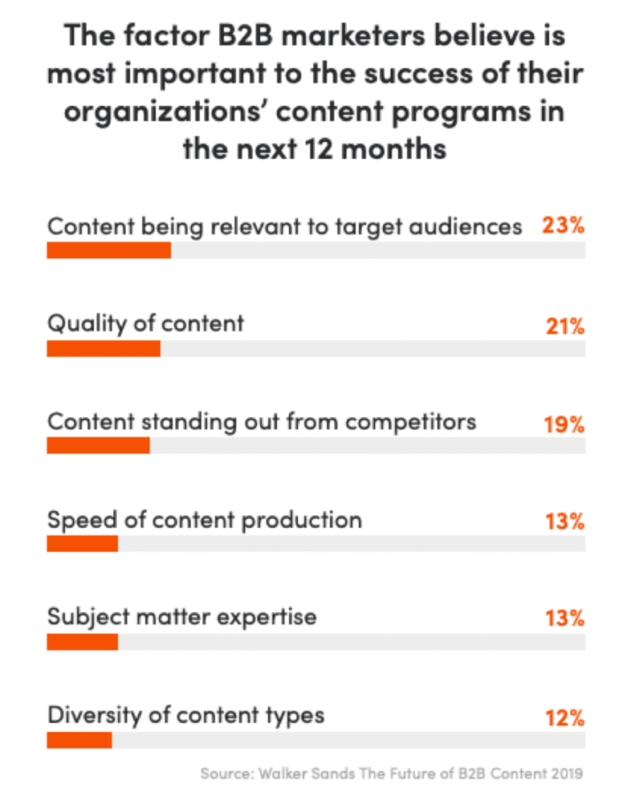 The biggest area to need improvement is content production, which 83% of B2B marketers are looking to address in the next 12 months. This was followed closely by strategy and ROI tracking, both of which 80% are hoping to improve. This guide is aimed at helping you improve your confidence in the value of content marketing by stepping you through a range of techniques to help marketers evaluate and prove their content effectiveness. While producing content and streamlining this process is obviously important, having a strategy in place and not just producing content for the sake of it is vital. Similarly, proving ROI enables marketers to get buy-in for future strategies and work, ultimately helping to get the best results. Other issues that marketers will be addressing include creating content that stands out from competitors (79%) and ensuring the content being produced is relevant for a brand’s target audience (77%). 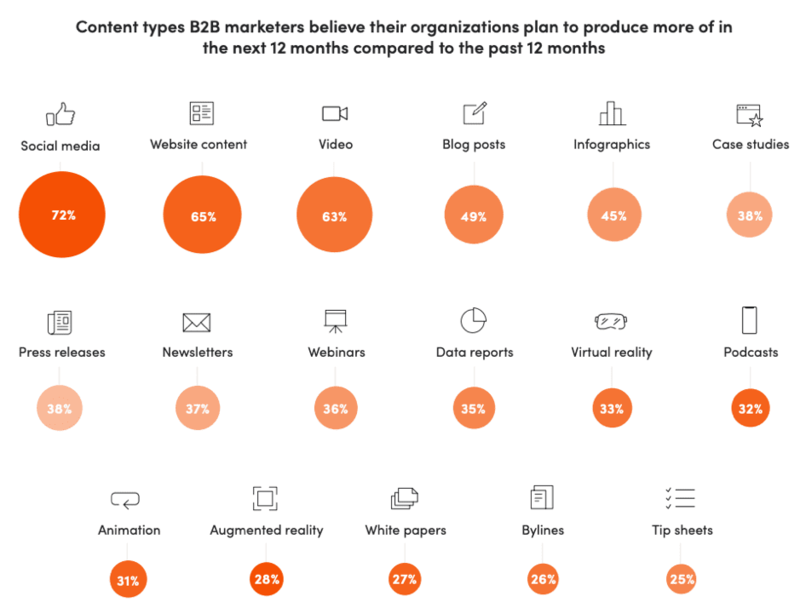 When it comes to the reasons for producing content, B2B marketers’ top goal is ‘boosting sales or converting customers’, with almost a third (29%) selecting this reason. As content can help to answer potential customers’ questions and inform them about a product or service – meaning a sales team doesn’t need to be involved as early in the process – this goal is hardly surprising. It also leads to the second most popular content goal for B2B companies, which is ‘building relationships with new customers’ (19%). Content can help build trust, show a company’s knowledge within a specific sector and be used to showcase social proof, such as other customer reviews. All of this can be beneficial when it comes to building relationships. Perhaps a bit surprisingly, the least important content goal, with just 7% of B2B marketers choosing it, was adding SEO value. This is slightly at odds with the 18% who selected ‘increasing brand awareness’ as a goal, as SEO-optimizing website content can help a website rank better for certain keywords and, ultimately, raise awareness of the brand. 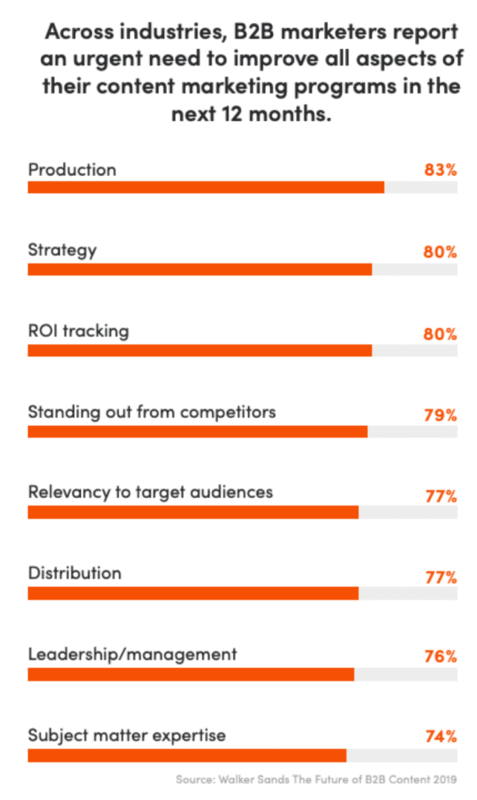 The factors that B2B marketers believe to be most important to the success of their content marketing strategies, content that’s relevant to target audiences is the most important. Selected by 23% of respondents, this factor reflects the top goal of B2B marketers when it comes to website content. Only relevant content is going to help incite potential customers to convert, as it will help to answer their questions, offer solutions to problems they have and show that a company is in the position to help them. Relevant content is also key to creating trust and building relationships with new customers, as well as maintaining existing relationships. As well as relevancy, 21% of B2B marketers see the quality of content as being important to the success of their strategies. While content may be relevant, it needs to be high quality in order to really show value and ensure that potential customers trust an organization. High-quality content can also help with the third most important factor, which is ‘content standing out from competitors.’ Ensuring content is well-researched, high quality and in line with brand guidelines can help brands stand out for all the right reasons. In terms of content that B2B marketers believe their companies are planning to produce more of in the next 12 months compared to the previous year, social media content is a big choice. Some 72% of marketers believe they’ll be creating more social media content in the next year. With social media platforms becoming more prevalent in consumers’ lives, as well as now being big parts of marketing campaigns to raise brand awareness, social content is an effective tool. In fact, 63% of respondents say that content on social media is key for attracting new customers while 58% say it is ideal for engaging existing customers. Around 65% of B2B marketers are going to be looking at website content, which is once again at odds with the fact that SEO is not a big goal for most. With sales and conversion being the ultimate goal for the majority of respondents, the increase in website content production ties in well with this. In third place is video, with 63% saying they believe their organizations are going to produce more of this content going forward. The good thing about video content is that it can be re-used across different platforms, helping to bolster social media and website marketing strategies. Video is also seen as being a good tool for aiding conversion and engagement, with 43% saying video content helps attract customers and 52% believing it is key to engaging existing customers. Does gated content pay off? Gated content is always a bit of a hot topic for B2B marketers, as requiring user information in order to provide access to content can offer a number of benefits. 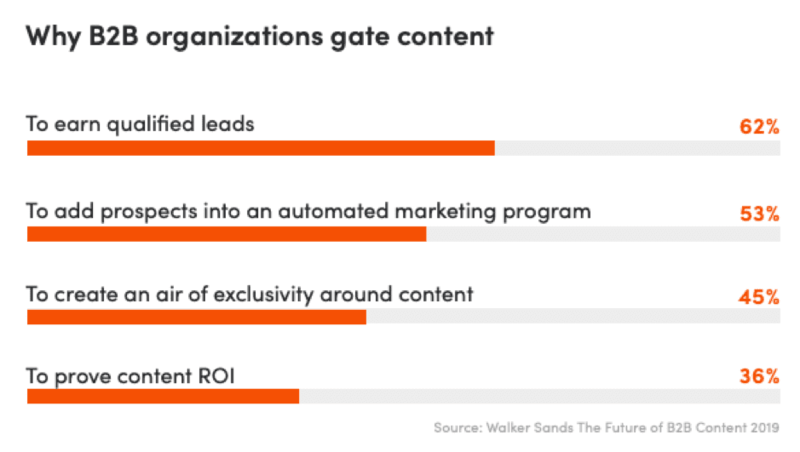 In fact, 62% of B2B marketers who gate content do so to earn qualified leads while a further 53% use gated content to add prospects into an automated marketing program, which can serve to nurture them toward conversion. These gains are hard to deny, especially if the content is good enough to warrant gating. However, the question should be raised of whether you gate all or certain content. After all, blogs can be a great way of bringing people to your site, but if every user needs to provide their data to read every blog, you might not get the results you’re after. In fact, 31% of all B2B marketers are put off from downloading content if they have to enter personal information. When it comes to marketers at VP level and above, this goes up to 45%, meaning that some decision makers may not be buying into your company. It is possible that people will not give their personal data to access content as they do not believe that the content is worth the “price”. This means that while 36% of B2B marketers gate content to prove ROI, they may well be failing to do this. Rather than gating all content, it is important to prove ROI with non-gated content. This can help to encourage website visitors to provide their information when it comes to high-value content, as they understand that it is likely worth it. However, if you have not used gated content on your website previously, you may want to get a better understanding of the impact that doing so in the future could have. With content now being seen as worth the investment for the vast majority of B2B marketers, it is now more important than ever to ensure your strategy is fit for purpose. Assessing the weakest aspects of your current content are addressed and that you have an over-arching strategy as well as individual plans for different channels will help to ensure success. While conversion and engagement may be your biggest goals for your content, you should also consider how other goals can play into these. SEO may be low on your list of priorities, but ensuring all content is SEO optimized will help raise your site in the SERPs and bring more people to it, bringing you closer to achieving your larger goals. Types of content and accessibility should also be considered. At the end of the day, user journey and experience need to be strongly considered. This means placing relevant content on the right channels and not putting roadblocks in place – such as requiring personal data for all content – that will affect this journey and experience. Going viral is something of a dream for us B2B content creators and marketers. You’d be lying if you deny that, plain and simple And why not? Creating original, high-quality content is a monumental task in itself, let alone marketing …..
Three ideas to help plan your digital marketing in 2019 With the end of the year on the horizon, as inevitable as night follows day, many people will be looking ahead to 2019 with a host of New Year resolutions: …..